Kishar is the oldest planetary colony outside of the Sol system. A dusty planet with a thin atmosphere orbiting at spitting distance of the dim red dwarf Proxima Centauri, Kishar is a fairly inhospitable world by modern standards. However, as the closest exoplanet to Sol, Kishar was the site of a major colonization effort in 2140's. These colonies, populated with the most desperate refugees from Earth, became the source of the population that now covers the surface of Kishar in airtight domes. 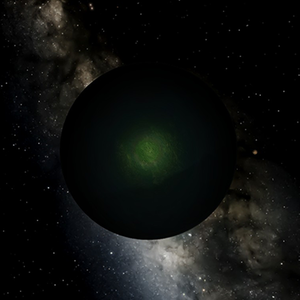 Kishar is a green-gray planet of silicate dust and transient streams of liquid water. Most of Kishar's enduring geographical features were buried under the shifting dust mounds by the time the colonists first arrived, although many of them have been given new relevance by underground construction efforts. A few small volcanoes dot the landscape, their occasional eruptions the last of an old world's geological activity. The dust shifts not only with the wind and rain, but with the gravitational pull of Anshar, Kishar's large moon. The earliest settlements on Kishar, and the mid-sized towns that crop up in the badlands, are a series of hermetically-sealed capsule habitats with narrow corridors running between them. The oldest settlements have largely grown into tall, self-contained arcologies that still bear an architectural resemblance to their origin as ramshackle tin-can towns. Most modern settlements, though, are built within tall geodesic environmental domes. These domes provide shelter from Kishar's heat and low pressure, and usually contain power-generating and atmospheric equipment. The interior of the domes is a snapshot of Earth, covered in hardy grasses and the occasional tree, with most buildings being made of wood and plaster. Kishar's population sits comfortably at just over two billion. Like most core worlds, Kishar has reached its carrying capacity, and this population has been stable for well over a hundred years. Kishar is almost exclusively human and somewhat hostile to outsiders. Kishar is notable for its unusual distribution of ethnicities in colonial populations, containing an abnormally large proportion of Romani, Native Americans, Ainu, and other historically marginalized groups, and an abnormally low number of Europeans and East Asians. The inhabitants of Kishar tend to be more conscious of their Earth-bound origins than other extrasolar colonists. Kishar prides itself on self-sufficiency. It contains an abnormal number of farms for a world of its population, and great care is taken to avoid importing much medicine or other essentials. Industry has been mostly exported to Anshar, where metals are more common and accessible and the gravity is lower. Beyond the bare necessities, Kishar is an off-Sol powerhouse of arts and entertainment. Many high-profile animation studios were born in the shade of a Kishari dome, as were many a big-name painter. VR, AR, and other high-tech art forms are uncommon on Kishar, where most of the population is fairly bioconservative. Kishar also hosts several prominent universities, most focusing on social sciences, architecture, arts, or engineering. More Icarus memeticists came out of Kishari universities than anywhere else outside of Sol, and the structures inside the domes are some of the most highly-regarded in the galaxy. Kishar, like many core worlds, has a high concentration of SolGov member states per square inch of habitable space. Most nations control three to five domes and the minor settlements in between, though individual city-states and larger, more decentralized nations do occur. Most of these are parliamentary or presidential republics, but a significant number of direct democracies also exist. One of the most important Kishari domes, Kanondaga is a biosphere in microcosm, containing artificial rivers, woodlands, and hills. It is a tourist destination and a major high-income area of the planet. Kanondaga's economy is split neatly between artisan farming and high-cost ecological experimentation-- data from Kanondaga was key to enabling humanity to easily colonize garden worlds with hostile fauna, such as Nisp. The first dome of Kishar, Nadu has outgrown the poor construction that marked its early history, and is now a densely-populated metropolis spilling out into no less than three suburb-domes, and extending down significantly below the surface. Nadu is the capital of SolGov's animation industry, and also produces a significant number of live-action film studios. VR is unpopular and legally restricted. This dome is the capital of New Yorubaland, the largest Kishari nation. It is known for its large commercial surface-to-air spaceport, which facilitates trade with Anshar and cements Yorubaland's material wealth. The Oyo-ni-aaye spaceport is a common victim of corporate takeovers and occasionally hostile sabotage, and is presently controlled by Proxima Centauri Risk Control. 2145: The first colony ships arrive in Kishari orbit after a long bluespace voyage. The ships remain in orbit while plans for the dome system are drafted. 2146: Owing to dwindling supplies and funds, progress on Putiya Nadu is accelerated, and the first colonists enter the planet's surface. 2150: Kanondaga and Oyo-ni-aaye established and colonized. Partial terraforming inside Putiya Nadu nears completion. 2154: Kishar contains eight domes, and is officially self-sufficient. 2161: The second wave of colonists arrive to appreciable infrastructure, quickly constructing several additional domes. 2166: Minor conflict with Heaven over mining rights in the system's Main Belt. Heaven wins, owing in large part to the relative disorganization of the Kishari alliance. 2178: The Kishari colonists officially fragment into a number of countries. This page was last edited on 5 September 2018, at 17:16.